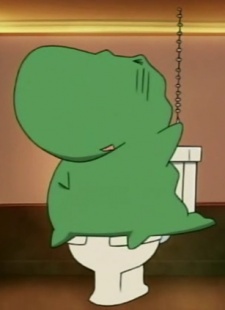 Pochi is an alligator which belongs to Mitsuki and the reason Izumi and Mitsuki ran away from home. Originally, Pochi's parents lived at Mitsuki and Izumi's home. However one of the alligators attacked Mitsuki, causing Mitsuki's father to have the alligators taken away and put down. Mitsuki finds an egg belonging to Pochi's parents, and discovers that she was partly responsible for what happened to Pochi's parents. Pochi likes cute girls and, for some reason, always tried to rip off Izumi's clothes. He strongly dislikes males. Note: Pochi is often used to name reptiles as if they were domesticated pets such as pet dogs, similar to the name Spot in western society.